Warson Brands, official licensee of Reebok military footwear, introduces the new Reebok Strikepoint line of 8-inch and 6-inch boots. The Reebok Strikepoint brings an impressive level of performance, athletic and comfort technologies to military professionals. Warson Brands, official licensee of Reebok military footwear, introduces the new Reebok Strikepoint line of 8-inch and 6-inch boots. The Reebok Strikepoint fuses athletic and tactical performance into a new breed of military boot. The Reebok Strikepoint eight inch boot (RB8840) and six inch boot (RB8640) both feature an extensive list of top-of-the-line technologies engineered by Reebok. 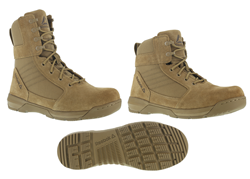 The eight inch Reebok Strikepoint boot in coyote brown is AR670-1 compliant for wear with the new U.S. Army OCP uniform. The Reebok Strikepoint has exclusive U-FORM custom fit technology, which is a heat activated mid-foot wrap that molds to your foot for a custom fit with no break-in period. U-FORM is activated by “baking” the boots in a standard oven, then wearing the boots seated while the U-FORM material molds to your foot. To reduce internal friction and heat build-up, the Reebok Strikepoint features an ETC® 360° Anti-Friction Technology lining that reduces blister causing hot-spots and keeps feet cool and comfortable. The lining is embedded with silver nanoparticles that fight fungus and odors. The Reebok Strikepoint features Reebok’s R52 rebound foam lightweight cushioned midsole and a FootFuel™ Footbed to bring the best comfort system to elite athletes who are on their feet all day in the most extreme situations. The R52 midsole is an ultra-responsive high rebound foam to help propel the wearer forward. The RopePro rope guard on the medial side of the rubber outsole aids in rope climbs during training and protects the boot during fast-rope descents during aerial deployments. Reebok military and tactical footwear is available through select duty uniform retailers throughout the United States. For more information on the Reebok Strikepoint and complete instructions on U-FORM, visit http://www.reebokwork.com/strikepoint. Warson Brands, also known as Warson Group, Inc., is headquartered in St. Louis, MO. Warson Brands is a global manufacturer and marketer of military, tactical, and industrial safety footwear since 1989, and provides a variety of work and duty footwear under the world’s finest brand names, Reebok, Rockport Works, Florsheim, Iron Age, Grabbers, and Knapp. Warson Brands is best known for innovation in the areas of foot protection and comfort. Its innovative comfort technology provides superior cushioning and impact protection in long wearing protective footwear that is both light weight and flexible. Warson Brands innovations in the area of foot protection include developing 100% non-metallic protective toe caps made from composite material that is stronger and lighter than steel, and also will not conduct heat, cold, or electricity. Innovations also include protective arch, heel, and metatarsal guards; outsoles that resist chemicals, abrasion, slick surfaces, and extreme heat; and patented devices to protect workers and equipment from static discharge. For more information, visit http://www.warsonbrands.com. Reebok International Ltd., headquartered in Canton, MA, USA, is a leading worldwide designer, marketer and distributor of fitness and lifestyle footwear, apparel and equipment. An American-inspired global brand, Reebok is a pioneer in the sporting goods industry with a rich and storied fitness heritage. Reebok develops products, technologies and programming that enable movement and is committed to accompanying people on their journey to fulfill their potential. Reebok connects with the fitness consumer wherever they are and however they choose to stay fit – whether it’s training, running, walking, dance, yoga or aerobics. Reebok Classics leverages the brand’s fitness heritage and represents the roots of the brand in the sports lifestyle market. A global fitness leader, Reebok is the sponsor of several elite fitness events, such as the Reebok CrossFit Games, Reebok Spartan Race, and UFC, the world’s leading mixed martial arts organization. Reebok Duty has previously sponsored the Orlando International SWAT Round-Up and Best Ranger Competition. Reebok tactical and military footwear is available through select duty uniform retailers throughout the United States. For more information, visit Reebok Duty at http://www.reebokwork.com, Reebok at http://www.reebok.com or, for the latest news at http://news.reebok.com/. Or, discover Reebok at the following locations: http://facebook.com/reebok, Twitter, and YouTube.